Generously sized with 2 beautiful 12” Oak Swing Handles, this basket is easy to make and recommended for beginners. Designed for my special friend Janice Walden—a gardener, basket maker and champion quilter—it has a filled bottom and is woven in plain weave with smoked and natural reed. 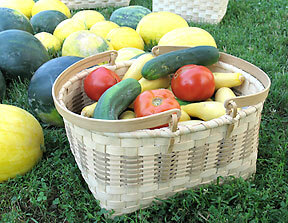 Calculate Supplies for 1 to 20 Basket for Janice with the Basket Supply Calculator. The Supply List gives you the least expensive way to purchase the supplies for your quantity of baskets. View on-line or print to your printer.